With full foam conversion and profiling facilities, Central Foam can incorporate ROHO mattress segments into any of our Forte Mattress designs. Whether you are needing a full ROHO sleeping surface with supportive foam sides and base or simply a single RHO segment in the pelvic region, we can accommodate your every need. Additionally we can manufacture the mattress to allow repositioning or provision for additional ROHO segments at a later date. ROHO Insert Placed Within Forte Icon Mattress - The ROHO insert can be placed in the precise location for each individual clients needs. The insert when inflated is level with the top of the mattress. Excellent infection control and stability - The ROHO insert is placed within the mattress cover. This ensures excellent infection control and simplifies cleaning. 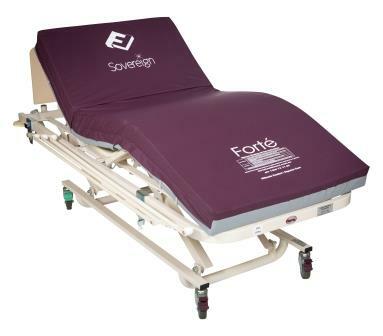 The Forte mattress provides additional lateral stability enabling easier patient transfers. Refer to the Forte Icon or Sovereign mattress for mattress coding.